Mabel was a regular stray, often found wandering alone by the Dog Warden. 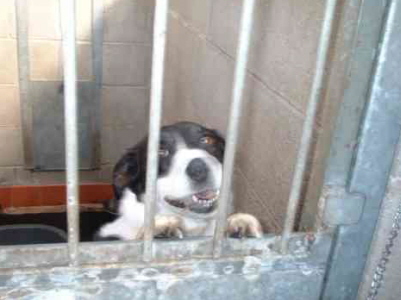 She was returned numerous times, either directly by the Dog Warden, or being reclaimed after a spell in the pound. It seemed that as soon as Mabel was claimed and home again she was out wandering the streets. 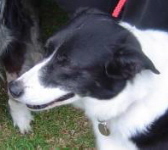 On the last occasion despite promises to collect Mabel, the owner didn't appear, and Mabel was left at the end of her 7 days facing being put to sleep. Fortunately Rochdale Dog Rescue stepped in and Mabel was moved into a foster home in Cheshire. Lucky Mabel caught the eye of Alison and her family, and they visited within the week to find out more about Mabel and see if she would fit into their home. It was love at first site on both sides, and Mabel found herself not only with a new home but a friend to play with. 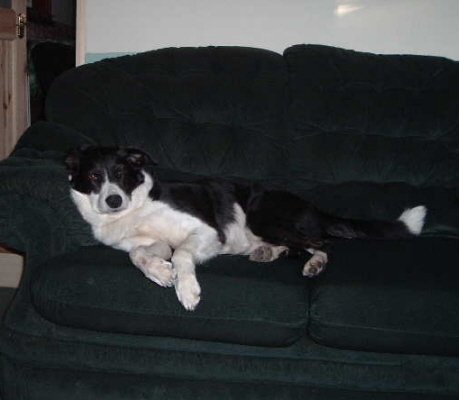 Sadly Brodie, Alison's other dog, passed away in 2006, but they decided there was space in their home and hearts' for another dog, and Alice joined Mabel. They are both adored by all the family. 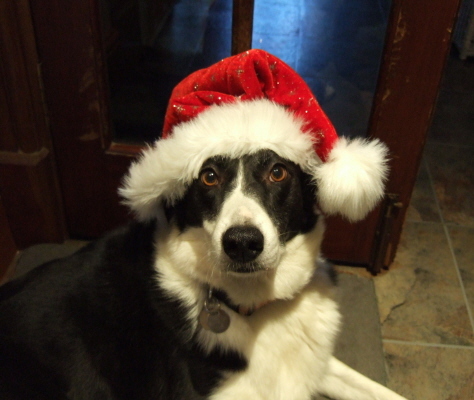 Alison says: "Mabel may not be the most beautiful of dogs, but we love her to bits. She does not have a nasty bone in her body. She loves to be loved. Alice encourages Mabel to be naughty and gets her to do all the things she cannot reach. When Mabel first came to us she used to wash up! She would remove everything from the washing up bowl and drainer and line them up all over the kitchen floor. For many months she never broke anything, but one day she got the cast iron frying pan down from the cooker. We are unsure whether it caught her but it has a large dent in it! Mabel has not done her party piece since then. She and Alice share a bed together, there is always a redundant one available; they are the best of friends." Alison added that she and her family are so grateful that they were allowed to adopt Mabel. Mabel, we wish you a long and happy life with your wonderful family. You've certainly landed on your paws there!